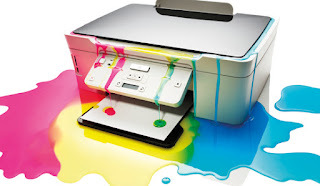 ink cartridges online - V4ink: Do you know How to Replace Ink Cartridges? Assuming you’ve bought your replacement cartridges and you’ve identified the need to install them, first you’ll need to push in the paper tray at the front of the printer. Step one, remove any paper resting on the tray; step two, push it in gently with the palm of your hand until it’s flush with the rest of the printer unit (has disappeared). To expose your printer’s internal mechanism, you will need to open up the front cover, which is located just above the paper tray. Much like a drawer, this has a finger indent at the top, which you will need to push in. You’ll hear a click and the flap will come down, causing the ink cartridges holder to automatically move to the center of the printer. To take out the old cartridges, use your thumb and index finger to gently pull them out of their slot. Do this with a steady hand and make sure you remove each cartridge one at a time. #4. Insert the new canon printer cartridges First, you will need to remove each cartridge from their packaging and lay them flat on an even surface. Next, you will need to pull the plastic tab from each cartridges’ to expose their nozzles. Once you have done this, you will need to insert each cartridge into their respective slot. To do this, make sure you insert them nozzle first and label up, with a firm push upwards until it clicks into place. Please note, the black ink goes into the right holder and the color ink goes into the left. Double check the cartridges are secure before closing the lid. Once you have closed the lid, the printer’s ON light (located on the top left) will flash green for a minute or so before staying lit. During any printer ink cartridges installation, conducting a test print is vital. Fire up your desktop, cue up a document, press print, take a look at the results and you’ll soon be able to see if the ink is printing the way it should. Please note, if the ink comes out streaky or smudgy, consult your Canon printer manual to check how to realign the printer heads. Should the triangular warning emblem (located on the top left) flash orange, re-open your printer and check the cartridges are installed correctly, by giving them a push.